EffOne provides end-to-end services that encompass all phases of Software Development Life Cycle - from requirements gathering to release and production support. In addition to the in-depth technical expertise, our teams possess subject matter expertise in a number of vertical industry domains. EffOne has developed solutions for several industries utilizing a breadth of technologies that resulted in many satisfied customers and many successful products. We have developed numerous mobile, web and desktop applications on all the leading platforms - .NET, Java, LAMP, ROR, iOS, Android and Windows, using all the standard development languages - C#, Java, C++, VB, utilizing industry standard databases - Oracle, SQL Server, MySQL, Sybase, DB2 and several open source and in-memory databases. Our teams are always leading the way in utilizing cutting edge technologies providing innovative solutions. With over 16 years of experience, our teams are familiar with all the development tools, frameworks, environments, source control systems and release management solutions. Our processes that have evolved over the years ensure a high degree of success while mitigating potential risks early on. EffOne provides mobile application development services to address the mobility requirements of both technology providers and end users. We have been developing mobile applications that are user friendly, high in performance and rich in functionality. We have a highly competent team of experts who have worked on various mobile platforms such as iOS, Android, Windows Phone and Blackberry. We use our people and best practices to provide you with the most up-to-date mobility solutions. Our goal is to provide professional, cost effective solutions for your mobile application requirements. Our clients have benefited extensively from our services resulting from a team that is dedicated and strives to attain success in all our endeavors. With more than two decades of Software Development experience in general and several years of mobile application development experience, we have expertise in various tools, frameworks and environments for developing mobile solutions. We have been developing Java applications since the mid-90s and have developed native C# applications that run on multiple devices utilizing various cross-platform tools. This experience helped us adapt to mobile application development when it evolved. We provide mobile applications that enable enterprises to help their customers manage transactions through mobile devices. We have helped our customers in bringing their enterprise applications to the mobile devices while retaining their web/custom interfaces. While developing solutions our mobile application team takes into consideration aspects of data security; back end integrations, mobile device management, middleware integration including the latest concept of BYOD (Bring your Own Device). 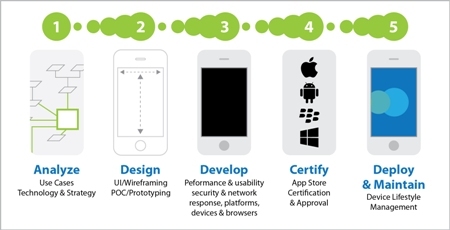 Why choose EffOne for Mobile Applications Development? EffOne provides web application services that help organizations to meet their business objectives through the World Wide Web. Our Web Application team brings in several years of experience in creating a great user experience using latest technologies in the current world. Our team utilizes a proven approach in bringing out robust web solutions. We have end-to-end expertise starting from design to deployment. We have experience in using various frameworks, environments, source control systems, development tools and release management solutions Some of the major technologies that we have used to build web solutions include ROR, SharePoint, ASP.Net, PHP, Adobe Flash / Flex, Java, JQuery & Ajax . Our primary goal is to provide professional, cost effective & in-time solution for our client's web requirements. Our teams are dedicated to the success of each project & we achieve this by deploying proven processes & procedures. Having more than two decades of Software Development experience in general and several years of web application development experience, we are well positioned to deliver successful projects. EffOne is a dynamic, US based Software Development organization focusing on Object Oriented technologies, specializing in the provision of the highest quality application development & programming services using Microsoft and Open Source Technologies. Over the years, EffOne has built an in-house repository of knowledge and experience across technologies, domains and practices that blend into best practices resulting in interoperatable, flexible, scalable and robust technology solutions meeting the clear objectives and challenges in today's dynamic market place. EffOne has a ready set of design and development tools and frameworks using which we can substantially reduce the overall development cost there by delivering excellent go-to-market results. 24/7 Technical Support Our communication channels are open 24/7 that connects you with right team of technical experts, instantly to reduce complexity and enhance productivity. Proven Methodologies: Effone has vast expertise of working in diverse business environments which allows them to utilize business best practices and proven methodologies. Design patterns can fasten up the development process by providing tested, proven development paradigms. Effective software design requires us to consider issues that may not become visible until later in the implementation reusing design patterns which helps to prevent subtle issues that can cause major problems. It also improves code readability for coders and architects who are familiar with the patterns. In order to achieve flexibility, design patterns usually introduce additional levels of indirection, which in some cases may complicate the resulting designs and hurt application performance. EffOne's Desktop Application development perseveres to rapidly transform your dynamic ideas and concepts into new products and applications while improving application performance reducing your business operations complexity and accelerating your business productivity. We have ultimate focus in providing our clients with the most exclusive user experience and control our in-house professionals and ensure that these desktop management applications are custom-made to the specific requirements and usability standards of our clients. We carefully examine your requirements and its functional adaptability through our exclusive Desktop Application Development services. Our experienced teams of software and design professionals closely understand your business module and then create a unique architecture to your bespoke Desktop Application Development. Our desktop applications facilitate instant content synchronization, quick file system access and ready management of downloadable content even while working offline. We have qualified marketing and client servicing executives to maintain a continuous and thorough communication with our clients to explain our work process and developments. Our teams design, develop and maintain desktop applications that are effective, easy to use, scalable and easy-to-maintain. The applications we develop facilitate enhancements that are modular. We have been able to achieve this because our architectures are robust, scalable and manageable.